Hong Kong is located on China's south coast and was a colony of the British Empire until 1997. Hong Kong tea culture blends aspects of both British tea culture and Chinese tea culture to develop it's own unique style of enjoying black tea. Tea is a popular drink in Hong Kong and the people there enjoy it throughout the day - for breakfast, in the afternoon, and at dinner. Most teas in Hong Kong come from China but decades of colonial rule under the British lent to the custom of enjoying "milk tea." The people of Hong Kong have succeeded in putting a unique twist on classic beverages! 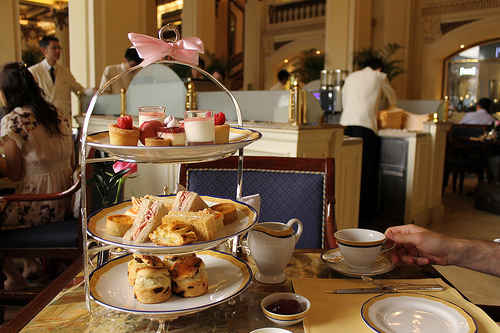 This tea approach is suggestive of the British style of enjoying tea where hot black tea is served with milk and sugar. It has become a prominent aspect of Hong Kong tea culture. 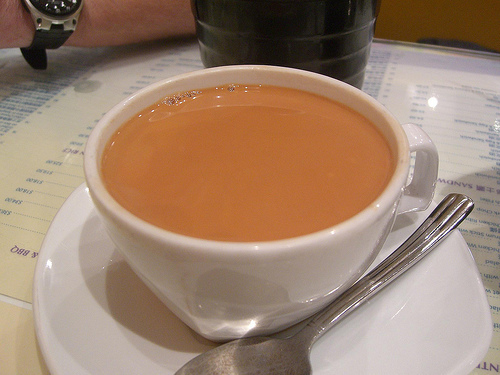 The big difference between Hong Kong-style and British-style milk tea is that the British normally use fresh milk instead of the condensed or evaported milk. Milk tea is not normally offered in traditional Cantonese restaurants or with dim sum. Yet it is consumed daily by many Hong Kongers and can be served hot or cold. 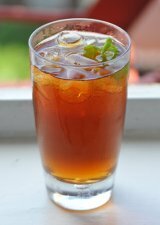 Make your own Hong Kong-style milk tea with this recipe from goldenmoontea.com. Yuanyang is literally Cantonese for "mandarin duck," referring to two things that are not alike (the male and female duck, which look very different from each other) but go together perfectly. The drink combines Hong Kong-style milk tea and coffee to create a unique creamy beverage that can be served hot or cold. The unlikely combination is a popular drink in Hong Kong. The old-style Chinese custom is to enjoy tea by itself or after a meal, but the Hong Kong tea culture has evolved toward serving food with tea. Traditional Chinese tea houses were frequented for tea and conversation but not eating. A respected Chinese physician in the 3rd century declared that eating food while drinking tea results in excessive weight gain. Now food is the main focus and tea is served to accompany the food. 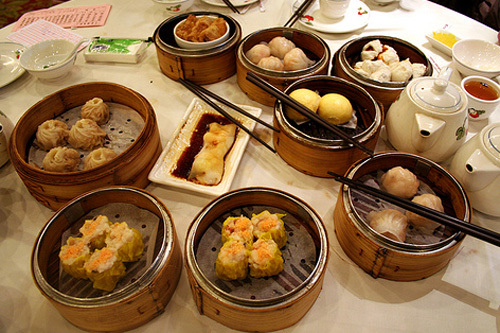 Dim sum can include savory dishes like meat-filled buns and dumplings as well as sweet dishes like tarts and pudding. Dim sum restaurants are lively places serving an impressive variety of dishes and bustling with crowds and conversation. 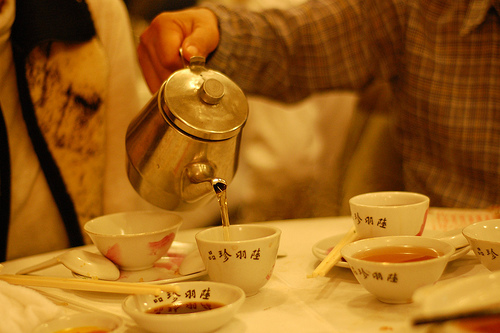 In Cantonese (spoken in Hong Kong and parts of Southern China), "yum cha" refers to the Chinese tradition of drinking tea. In modern times, yum cha has come to mean sipping tea while eating dim sum. In Hong Kong, "yum cha" and "dim sum" have come to mean the same thing. Various Chinese teas can be ordered to go with dim sum. The polite way of asking for more water in your teapot while enjoying dim sum is to leave the lid ajar. Cha Chaan Teng translates to "tea food hall" or "tea restaurant" and represents a distinctive part of the Hong Kong tea culture. 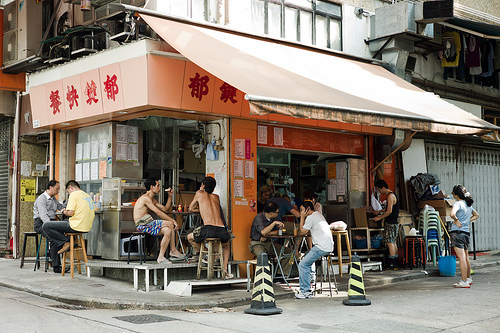 At these diners, located throughout Hong Kong, customers are served inexpensive black tea when they sit down. 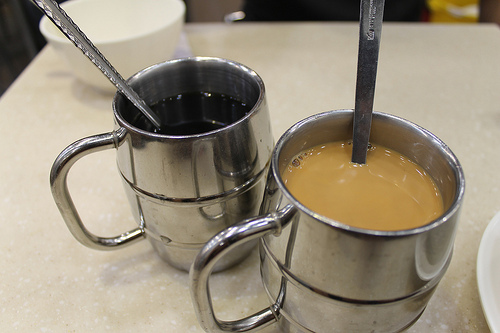 Hong Kong-style milk tea and lemon tea are also popular at these establishments. The food served is a mix of Hong Kong and Western cuisine. If you find Hong Kong tea culture interesting, be sure to check out our other tea culture pages!